Planning schemes are made up of maps and ordinance. The ordinance are the policies and written clauses and the maps depict where the zones and overlays apply within the planning scheme area. This is a current copy of the planning scheme. If you are unfamiliar with using planning schemes, we suggest you visit Using Victoria's planning system. You should obtain advice from either a council planner or a planning professional before taking any action which may be affected by a planning scheme requirement. 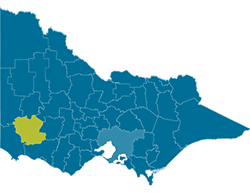 The following planning scheme is used specifically for the Southern Grampians Local Government Area (LGA). The planning scheme is set out in 'Table of Content' format below. You can choose one or more options and select the "Filter results" button to filter the list of clauses. Please note that the combined version of this planning scheme is a large document and may take some time to download. This document is not always updated as quickly as the individual documents listed below. You should check the last updated date against the date the planning scheme was last updated at the top-left of this page.